What Can I Do With My Dog? Watch these super demonstrations and get some ideas! Our opening act! Come and see the drill team go through their paces with their pooches! This is an activity you can do with YOUR dog! Girl Scout Troop 660 is putting on a "bunny hunt" at the Rescue Roundup. For a small fee, you can have your dog find the bunnies in a barn-like setting. There will be a small prize for every participant and all proceeds go to a local shelter that the girls will pick out. Help the Girl Scouts achieve their Bronze Award! 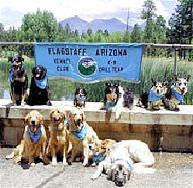 Watch the stars from Arizona Border Collie Rescue rock the agility course at the Rescue Roundup! 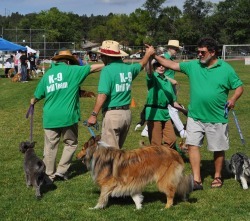 We have many dogs that participate in this venue, but all breeds can compete and do very well. Watch these gentle giants show off their carting skills and find out more about the breed. This is an up and coming activity you can do with your dog! Check out the cool demo on how to start this new sport. We will share a moment with a Rainbow Bridge Board and bubbles sent to Heaven to remember the light of our lives.